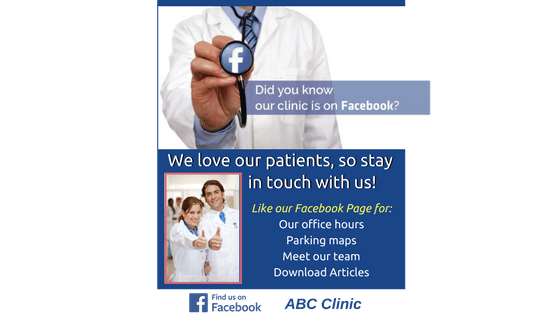 Do Your Patients Know That You Are On Facebook? When you have a Facebook Page for your business / clinic, you want people to view your content and engage with you. When people relate to your content, they will ‘like' your posts and your page. When more people ‘like' your page, your content and message gets shared more quickly. Would you like to be able to have your content on Facebook shared to more people? Certainly! Your patients already know you. Now is the time to invite them to ‘like’ your Facebook Fan Page, too! The Facebook fan page is your business page where you can share information with your patients. When your patients and family are in the waiting room remind them with a poster that you have a Facebook Page. This is an ideal time for them to take a minute to visit your Facebook page and like both the page and the content that you have posted. You can print it out right away or upload them to Canva or another photo editing software to add your Facebook Page name, clinic logo, etc. If you are already a member or Practice Management Success, this poster is already in your membership area. Click Here to go directly to the social media images and training now.